Teaching phonics and reading to young children is a rewarding experience for me. In addition to children I taught in a classroom setting, I have successfully taught three of my own children to read. But what works for one child does not always work for another, as I am learning with Margaret. She is a delightful student, but I find that my "tried and true" methods don't work as effectively for her. The skills are not sticking, leaving her (and me!) frustrated. When Logic of English offered me the chance to review a phonics program for free in exchange for a review on this blog, I was more than willing to try this out with my Margie. Logic of English is a research-backed program that teaches multi-sensory systemic phonics instruction in order to help learners of all ages become proficient readers and spellers. That may sound like a mouthful, but it actually just refers to using multiple senses (seeing, feeling, hearing, etc.) to learn phonic rules in a step-by-step manner. Their programs been used with beginning readers, dyslexic students, remedial readers, and readers in which English is not their first language, as well as students who just want to advance their own reading and writing skills. I received Foundations A to use with Margaret which is intended to be used with beginning or emergent readers (Pre-K to grade 1). Included in the package was the teacher manual, manuscript student workbook, whiteboard, tactile letter cards, phonogram flashcards, and phonogram game cards. I was a tad overwhelmed at everything until I opened the teacher manual and began reading how to use the program. It is all laid so nicely I knew I wouldn't have any trouble. I love how at the start of each lesson there is a blue box that told me exactly what I would be needing, including optional items. Nothing is more frustrating than to get halfway through a lesson only to discover I needed to get something ready beforehand. I know this problem could be eliminated by reading the lessons ahead of time, but I have five kids in two different learning environments and I am trying to teach three different levels at home. Not going to happen. It's like this program was designed for moms like me. Moms who want to be able to plan cute and fun instructional lessons, but who just can't. Moms who want to use the colorful and creative learning activities, but don't have the time or ability to plan that stuff. Foundations A did it for me. The teachers manual is attractive and easy to use. The lessons are fun and engaging. They are easy to follow and fun to teach. Margaret is five and I felt the program was perfect for her. She already knows her letters and sounds, and can sometimes spell and read simple C-V-C words. Foundations A offered new ways to explore these skills and provided a great way to reinforce phonetic rules already learned. It also provided her with writing practice (which she desperately needs), as well as introducing words with blends and short vowels. In my opinion, young children can not receive too much phonics instruction. Skills they learn in these younger years will represent their spelling, reading, and writing for years to come. They can, however, learn poor phonics skills. Foundations A emphasizes rules, pronunciation, and practice using multi-sensory methods. A typical lesson would take us anywhere from 25 to 45 minutes to complete. This was mostly dependent on the skills being taught and how attentive Margaret was feeling. The lesson would typically start with some oral practice, or a game with the game cards. A new phonogram would be introduced and there would be activities associated with it. Handwriting practice would occur on the whiteboard or in the workbook. I tended to stick with the whiteboard because Margaret's writing skills are very undeveloped and she tends to need a lot of extra practice. She also stays more focused while using a whiteboard. When she has a piece of paper in front of her it quickly becomes cluttered with drawings a doodles. I know, I know. But she is trying so hard to hold the pen correctly. She really is! I decided on the manuscript over cursive for the program, and I know this is a hot topic of debate in many circles right now. I feel that for my family, manuscript is the way to learn letters. It is what books are printed in, computers use manuscript, and most adults write in manuscript. I am not denying the importance of cursive, and Foundations A is available in both cursive and manuscript, making it easy for you to get what is best for your family. The tactile cards were also an invaluable tool for this program. Margaret definitely learns better when she is shown many different ways to do the same thing. These sandpaper letters offered another way to "experience" writing the letter. The roughness and the directional instructions helped to reinforce proper pen-strokes. The lessons do move quickly, and we would on average complete three a week. Sometimes we would skip parts of a lesson and or repeat sections. This was all dependent on Margaret's interests and skill level. The program was very adaptable to our needs and was easily modified to meet the requirements that I needed for Margaret. I plan to continue to use Foundations A a few times per week even though my review obligation has ended. I really like the progression and sequence of the skills taught. It just makes sense to teach phonic skills in this manner. Margaret really enjoyed the student workbook with it's colorful pages and cut-out activities. I had a short glimpse into the Foundations B workbook and I am hoping that she stays interested in this program long enough for me to be able to buy that program as well. At the end of the lesson Margaret was allowed to use the whiteboard to doodle. Here she is drawing a letter house with backyard play equipment. I liked having my own chalkboard (whiteboard) but you know what? Sometimes when the letters were together they were too hard to say and I didn't like that part. But I liked it when we matched things. That part was fun. The Logic of English Foundations A can be purchased on the website for $34.20 for the Teacher's Manual and $16.20 for the student workbook. The other items I received can be purchased on the website starting at $9.00. I encourage you to explore their website for ordering options. In addition to Foundations A, Logic of English offers many other products to fill your language arts needs. 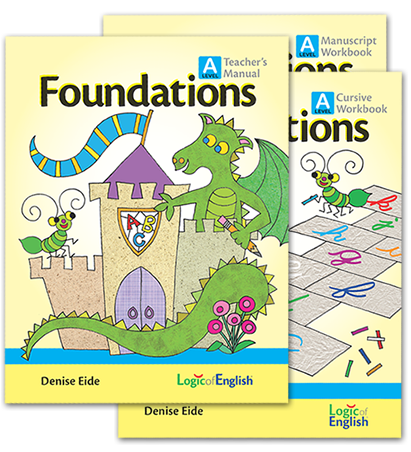 Foundations B is the next book in the Foundations series, Essentials is a program designed for students ages 7+, the Rhythm of Handwriting is an easy to teach handwriting program available in manuscript or cursive. Visit the Logic of English Website to further explore these options. Other reviewers on The Schoolhouse Review Crew got to try out products from The Logic of English with their students. Click here to read those reviews, or click the banner below.